American Artist, Eddie Dominguez, b. 1957, Tucumcari, New Mexico is one of the leaders of American contemporary ceramic art and mixed media. Influenced heavily by his childhood experiences in New Mexico, Dominguez has, for the last 30 years explored cultural and social issues such as ethnicity, political tension and gender in his art. Never dependant on any single medium, Dominguez has used ceramics, metal, canvas, glass, concrete and paper – and views his pieces as part of a collective story about art, life and himself. Eddie Dominguez is an Assistant Professor of Ceramics at the Department of Art and Art History at the University of Nebraska, Lincoln, Nebraska. 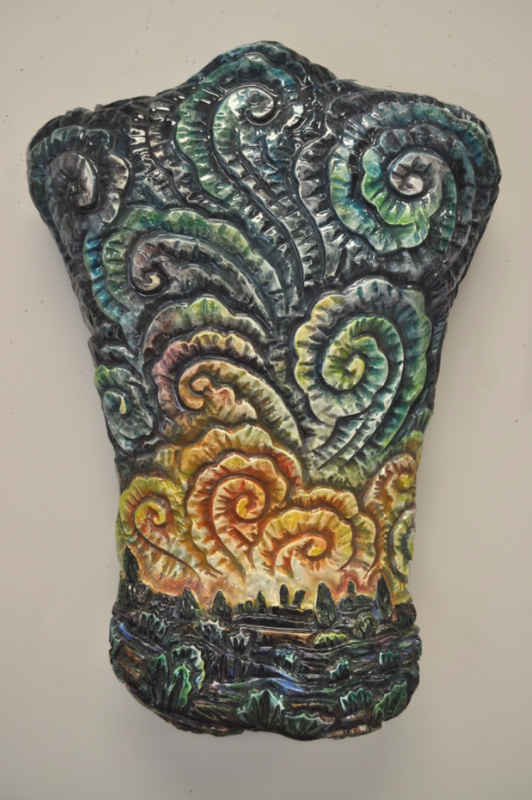 He has a BFA from the Cleveland Institute of Art in Cleveland, Ohio and an MFA from New York State College of Ceramics, Alfred University, Alfred, New York. His work is in the permanent collections of the Smithsonian Museum of American Art, the Cooper-Hewitt, the Renwick Gallery, The Sheldon Memorial Art Museum, The Museum of Nebraska Art, The Albuquerque Museum of Fine Arts, The Santa Few Museum of Fine Arts, Detroit Art Institute and many other galleries and private collections.